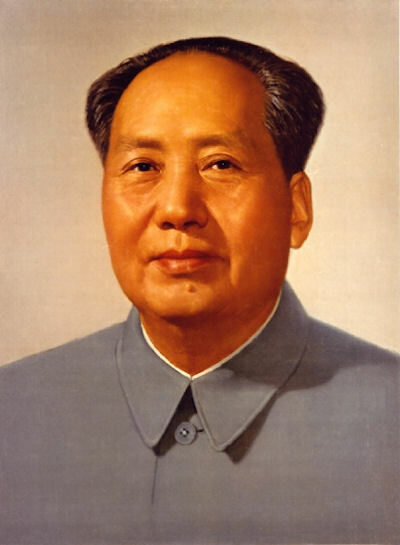 Mao Zedong was a Chinese communist leader and founder of the People’s Republic of China. He was responsible for the disastrous policies of the ‘Great Leap Forward’ and the ‘Cultural Revolution’. He was the head of the Chinese Communist Party for forty-one years after the historic Zunyi meeting (1935) during the Long March. He built up the Red Army (later referred to as the People's Liberation Army), took part in the anti-Japanese War and the civil war in China and established the People's Republic of China. He was one of the most influential people in the modern China of history. His dramatic personal life, his military talent, his artistic poems, his political skill and his famous third world classification theory have influenced generations of people. Mao Zedong, also well known as Chairman Mao, was born into a peasant family on December 26 1893 in a village called Shaoshan in Xiangtan County, Hunan Province. Of Hunanese peasant stock, Mao was trained in Chinese classics and later received a modern education. After training as a teacher, he travelled to Beijing where he worked in the University Library. It was during this time that he began to read Marxist literature. As a young man he observed oppressive social conditions. In 1921, he became a founding member of the Chinese Communist Party (CCP) and set up a branch in Hunan. In 1923, the Kuomintang (KMT) nationalist party had allied with the CCP to defeat the warlords who controlled much of northern China. Then in 1927, the KMT leader Chiang Kai-shek launched an anti-communist purge. Mao organized (1920s) Kuomintang-sponsored peasant and industrial unions and directed (1926) the Kuomintang's Peasant Movement Training Institute in Guangzhou. After the Kuomintang-Communist split (1927), Mao led the "Autumn Harvest Uprising" in Hunan, leading to his ousting from the central committee of the party. Mao and other communists retreated to south east China. From 1928 until 1931 Mao, with Zhu De and others, established rural soviets in the hinterlands, and built up the Red Army. In 1931 he was elected chairman of the newly established Soviet Republic of China, based in Jiangxi province. In 1934, after the KMT surrounded them, Mao led his followers on the ‘Long March’, a 6,000 mile journey to northwest China to establish a new base. After withstanding five encirclement campaigns launched by Chiang Kai-shek, Mao led (1934-35) the Red Army on the Long March (6,000 mi/9,656 km) from Jiangxi north to Yan'an in Shanxi Province, emerging as the most important Communist leader. During the Second Sino-Japanese War (1937-45) the Communists and the Kuomintang continued their civil war while both were battling the Japanese invaders. The Communists and KMT were temporarily allied during eight years of war with Japan (1937-1945), but shortly after the end of World War Two, civil war broke out between them. The Communists were victorious, and on 1 October 1949 Mao proclaimed the founding of the People’s Republic of China (PRC). Chiang Kai-shek fled to the island of Taiwan. In 1949, after the Communists had taken almost all of mainland China, Mao became chairman of the central government council of the newly established People's Republic of China; he was reelected to the post, the most powerful in China, in 1954. Mao and other Communist leaders set out to reshape Chinese society. Industry came under state ownership and China’s farmers began to be organised into collectives. All opposition was ruthlessly suppressed. The Chinese initially received significant help from the Soviet Union, but relations soon began to cool. In an attempt to break with the Russian model of Communism and to imbue the Chinese people with renewed revolutionary vigor, Mao launched (1958) the Great Leap Forward. The program was a failure, and Mao withdrew temporarily from public life. The ‘Great Leap Forward’ aimed at mass mobilization of labor to improve agricultural and industrial production. The result, instead, was a massive decline in agricultural output, which, together with poor harvests, led to famine and the deaths of millions. The policy was abandoned and Mao’s position weakened. In 1959 Liu Shaoqi, an opponent of the Great Leap Forward, replaced Mao as chairman of the central government council, but Mao retained his chairmanship of the Communist party politburo. In an attempt to re-assert his authority, Mao launched the ‘Cultural Revolution’ in 1966, aiming to purge the country of ‘impure’ elements and revive the revolutionary spirit. Much of the country’s cultural heritage was destroyed. A campaign to reestablish Mao's ideological line culminated in the Cultural Revolution (1966-76). In September 1967, with many cities on the verge of anarchy, Mao sent in the army to restore order. Liu and others were removed from power in 1968. In 1969 Mao reasserted his party leadership by serving as chairman of the Ninth Communist Party Congress, and in 1970 he was named supreme commander of the nation and army. Chief responsibility for the grave "Left" error of the "cultural revolution", an error comprehensive in magnitude and protracted in duration, does indeed lie with Comrade Mao Zedong. But after all it was the error of a great proletarian revolutionary. Comrade Mao Zedong paid constant attention to overcoming shortcomings in the life of the Party and state. In his later years, however, far from making a correct analysis of many problems, he confused right and wrong and the people with the enemy during the "cultural revolution". While making serious mistakes, he repeatedly urged the whole Party to study the works of Marx, Engels and Lenin conscientiously and imagined that his theory and practice were Marxist and that they were essential for the consolidation of the dictatorship of the proletariat. Herein lies his tragedy. While persisting in the comprehensive error of the "cultural revolution, " he checked and rectified some of its specific mistakes, protected some leading Party cadres and non-Party public figures and enabled some leading cadres to return to important leading posts. He led the struggle to smash the counter-revolutionary Lin Biao clique. He made major criticisms and exposures of Jiang Qing, Zhang Chunqiao and others, frustrating their sinister ambition to seize supreme leadership. All this was crucial to the subsequent and relatively painless overthrow of the gang of four by the Party. In his later years, he still remained alert to safeguarding the security of the country, stood up to the pressure of the social-imperialists, pursued a correct foreign policy, firmly supported the just struggles of all peoples, outlined the correct strategy of the three worlds, and advanced the important principle that China would never seek hegemony. Mao appeared victorious, but his health was deteriorating. His later years saw attempts to build bridges with the United States, Japan and Europe. In 1972, US President Richard Nixon visited China and met Mao. Mao died on 9 September 1976 at the age of 83. In the field of philosophy, Mao's ideas are considered culturally significant rather than original; still, his ideas have had a monumental impact on generations of Chinese, and have significantly affected the rest of the world. One significant idea was his view of peasants as the source of revolution. He also built on the theories of Hegel, Marx, and Taoism to create a new theory of materialist dialectics. Mao developed more practical ideas, such as a three-stage theory of guerilla warfare and the concept of the people's democratic dictatorship. He wrote several other philosophical treatises, both before and after he assumed power.